One of three neuroradiologists at Radiology Associates of Appleton, Dr. Keyvan Gharabeighlou specializes in diagnostic radiology of diseases of the central nervous system, head and neck. Dr. Gharabeighlou also provides patients and referring physicians a range of pain management options. Using minimally invasive procedures, he provides prompt and lasting relief of acute and chronic pain. The most common procedures involve injecting long-acting anesthetic and steroids into joints for long-term pain relief. Most of the procedures are performed on an outpatient basis. Dr. Gharabeighlou received his medical degree from Kirksville College of Osteopathic Medicine in Kirksville, Mo. He completed his internship at Wilson’s Hospital in Johnson City, N.Y., and his residency at the Cleveland Clinic in Cleveland, Ohio. 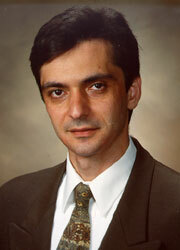 Dr. Gharabeighlou went on to complete a fellowship in neuroradiology at Mayo Clinic in Rochester, Minn. He joined Radiology Associates in 2003 and is board certified in diagnostic radiology by the American College of Radiology and holds certificate of added qualification in neuroradiology. Dr. Gharabeighlou is also a member of the Radiological Society of North America, the American College of Radiology and the American Society of Neuroradiology.